How do I connect to a MySQL database using Sequel Pro? 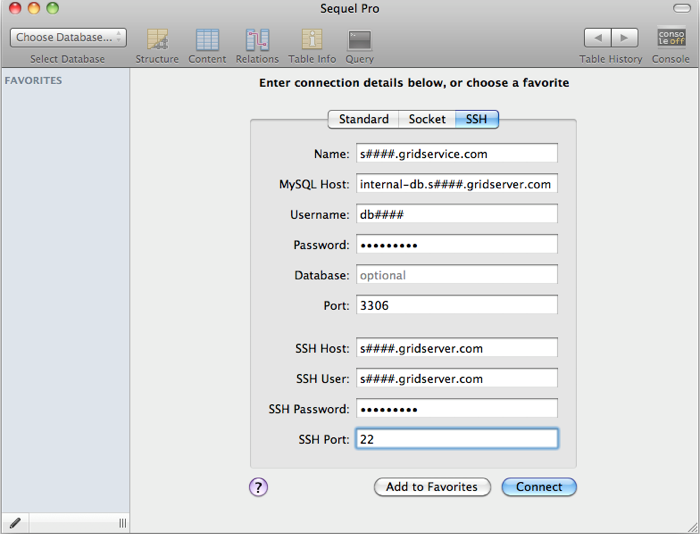 The following article will show you how to setup Sequel Pro to make a secure connection to your MySQL Databases. You can find your access domain in the Server Guide in your AccountCenter. Your access domain should look like s000000.gridserver.com. (Be sure to replace 000000 with your site number). SSH enabled and your SSH password. Your SSH password can be set in your AccountCenter on the Server Administrator page. Make sure SSH is enabled as well. For step by step instructions, please see: Connecting via SSH to your server. Your MySQL hostname, username, and password. How can I create a database? You may find you need to manually set the MySQL or SSH port numbers. On the Grid, we use the standard ports for MySQL and SSH. To setup Sequel Pro, we will use an SSH connection to ensure a secure connection to your MySQL database(s). Choose SSH under the connection details, see Figure 1. Enter your information, see Figure 2. Name: s000000.gridserver.com (Be sure to replace 000000 with your site number). MySQL Host: internal-db.s000000.gridserver.com (Be sure to replace 000000 with your site number). Username: db000000 (Be sure to replace (Be sure to replace 000000 with your site number). Password: The password for your MySQL user. Database: (optional) Leave blank to have access to all of your databases. SSH Host: s000000.gridserver.com (Be sure to replace 000000 with your site number). SSH User: s000000.gridserver.com (Be sure to replace 000000 with your site number). SSH Password: Your ssh password. Click on Add to Favorites, then double-click on the new bookmark to connect to your MySQL databases.